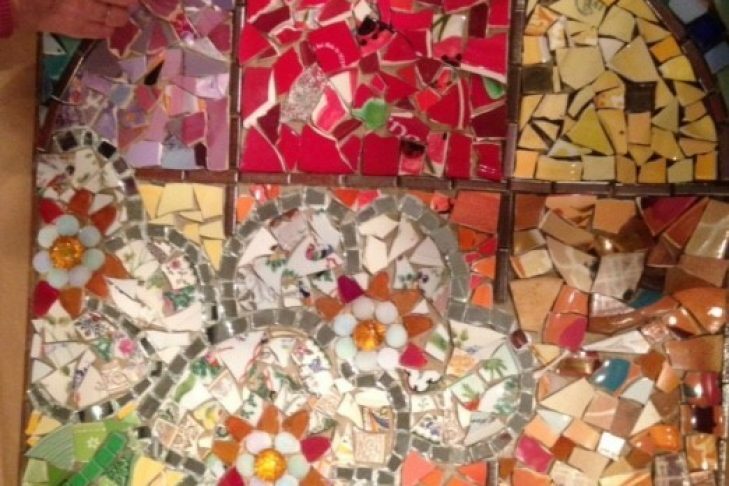 Please join the Vilna Shul over wine and cheese on June 2 for the official debut of the community mosaic art installation, “Sacred Flowers”, that was created last November by dozens of community volunteers. Envisioned and fascilitated by Artist Bette Ann Libby, this mosaic is yet another step towards the restoration and beautification of the Vilna. This mosaic celebrates the merging of the old and the new Vilna; it is born from the peeling images that were painted on the back wall decades ago but today is something new and inspiring for all who walk into our Community Room. Validated parking is available for only $5 at the Charles River Plaza/Cambridge Street Garage at 165 Cambridge Street. Please note that this is NOT the outdoor lot at the Whole Foods, but the garage immediately after the Whole Foods lot before the Au Bon Pain. You should receive a green parking ticket that will need to be stamped at The Vilna. The Vilna is also accessible on all MBTA lines. For parking, driving, walking and public transport directions, please visit the location page on our website. Please email events@vilnashul.org or call (6127) 523-2324 with questions.